School Cleaning. Cleaning is a very responsible job, especially in schools where everything has to be spotless because it is very important for the health of the children who spend a big part of their days there. It is about an institution that together with the kindergartens, has to be always in a perfect condition. That’s why the authorities always invest a lot in their purity and maintains. Valentine works as a cleaner in the city primary school. She works really hard and she completes her everyday responsibilities with great attention because students know to forget or lose somewhere in the school their belongings very often. And sometimes it is about rather valuable objects, so she has to take a lot of care, everything to be back where it belongs. Taking care of all of that, Valentina works very cautiously, cleaning every spot of the school in details. After finding certain objects, and that could be rather often, Valentine places them in the bureau for lost objects in the school where she keeps them safely until she finds their owner. The students love and appreciate Valentina because she is always willing to help them find their belongings. 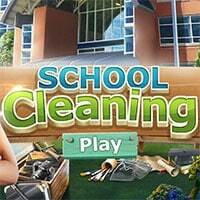 School Cleaning is a free online hidden object game on Hidden4Fun.